Warning, don't watch this movie. It may rearrange your neural pathways. Saturday night at the Bunny Bungalow, Tall Husband and I viewed the video of the movie, Room, starring Cyndi Williams. I can't believe we watched the whole thing. I guess it was kind of like road kill. It's the worst movie we have ever seen. It was filmed right here in Houston. Now everyone knows Houston isn't Paris but the director and cinematographer (here I use these two words out of kindness) fixated on our warts. If I wanted to see ugly neighborhoods I know where to go. Speaking of ugly, if I wanted to see real people, I could just hop in my old bemer and drive to Lufkin, Texas to visit my cousin Edna and her crew in their double wide. What's wrong with a little Hollywood glamour? Speaking of glamour, if I wanted to see a fat girl make out, I could like just look over at the mirror on my closet door any night. And did I mention the cheesy special effects? 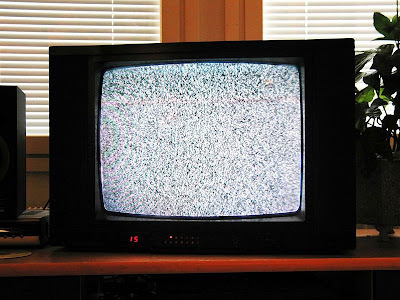 Well, every time Fat Girl (Leading Lady) had a spell, we had to watch five minutes of what looked like snow on an old analog television. And the movie had no climax, well except for Fat Girl in that grungy motel room. She never found the room she kept seeing in all that T.V. snow and we never learned what was causing her spells. So don't make room for Room in your viewing schedule. Image of Television "snow" is from Wikipedia and is used by permission of common license. Photographer is Mysid.